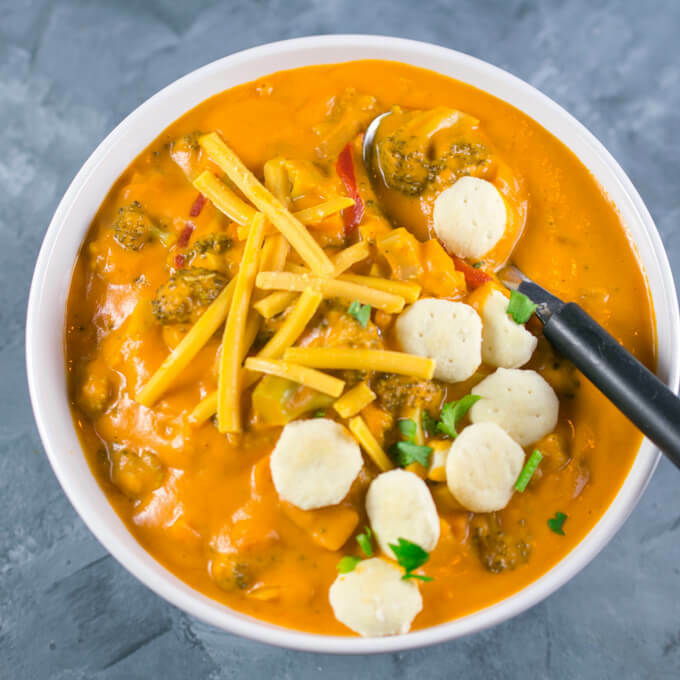 Top Vegan Recipes of 2018 | Yup, It's Vegan! You are here: Home / Recipes / Your Top 10 Vegan Recipes of 2018! 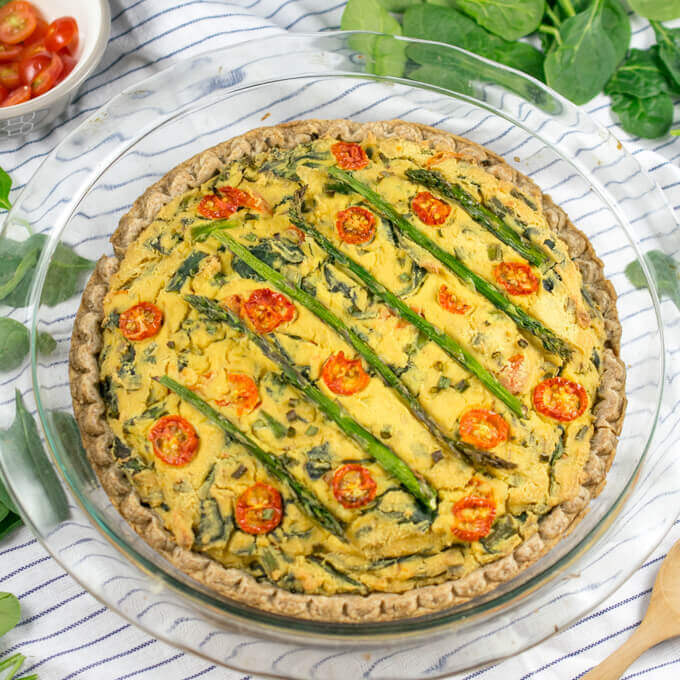 Your Top 10 Vegan Recipes of 2018! 2018 was a good year over here in Baltimore! I marked my 5th year of running this site, turned a house into a home with my beloved, and cooked and ate lots of delicious food in between. Aaaand that’s enough about me, you’re here for the food! Today I’m reviewing the favorite top 10 vegan recipes of 2018 from Yup, it’s Vegan, as measured by number of reader views and remakes. As a bonus, I’m throwing in a few personal favorites that were underrated this year. A second cookbook-derived recipe also made your top 10 vegan recipes of 2018. 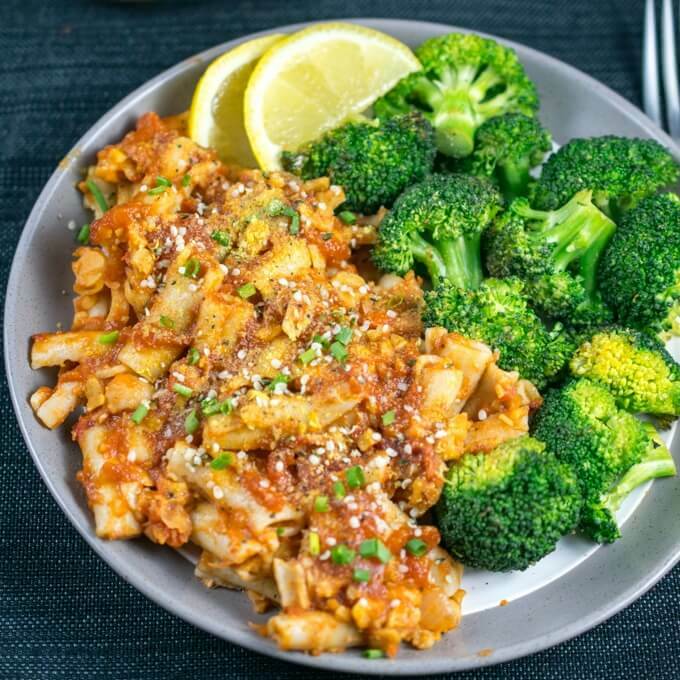 This roasted red pepper chickpea pasta surprised me by being a hit, since it was shared as part of a somewhat critical review of Power Vegan Meals. But I changed the recipe quite a bit and you all loved it! Chickpea crumbles, roasted red peppers, smoked paprika, and tomato made this pasta sauce spicy and nourishing. One reader on Instagram called it a “delicious pasta meal that was well worth the prep!”. 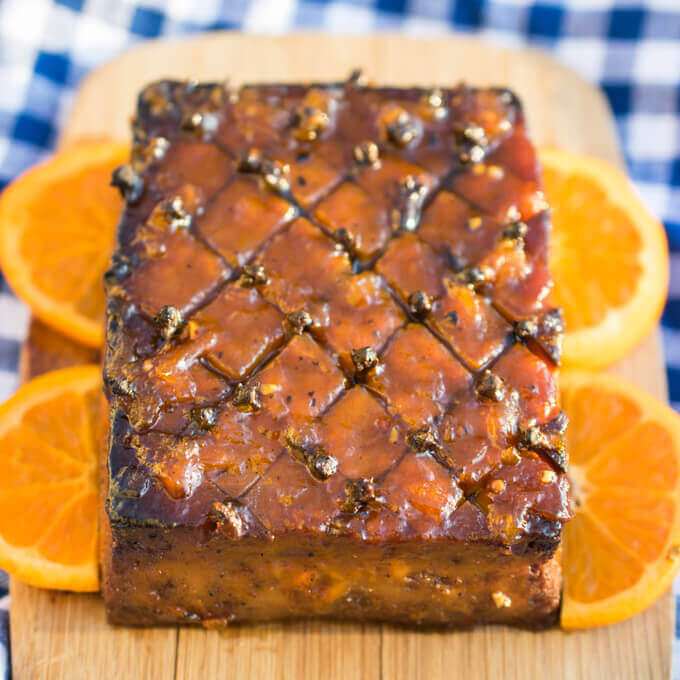 I posted this magnificent glazed tofu roast AKA tofu ham just in time for the holidays and was delighted to see so many of you prepared it for your holiday feasts. I, too, made it for Thanksgiving, every potluck I attended, and Christmas, to near universal acclaim. (Just be sure to tone down the spiciness if kiddos are dining). One reader weighed in that, “It was delicious! One thing I really like about the recipe is that it uses everyday ingredients and I had almost everything on hand already. It’s also not complicated to make but has wonderful flavor.” We concur! My carrot top pesto was a sleeper hit this year! Sometimes I need to be reminded that you all love recipes that help with using vegetable trimmings or leftovers, to reduce kitchen waste. Instead of doing the usual olive oil and basil thing, I combined blanched carrot tops with fresh mint and scallions to make a bright, fresh and unique flavor. Add toasted walnuts for a richer and more deep flavor, or leave it at that for a tested nut-free variation. Many readers weighed in with their own variations and how they served this wonderful sauce! I was seriously proud of my vegan chocolate chip cookies from the get-go, but they really took off after a Reddit post made them look far better than I ever did! 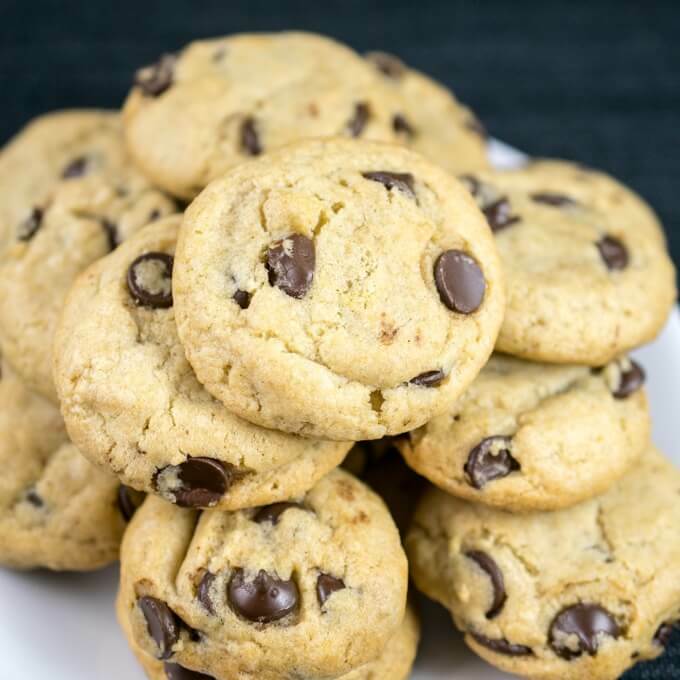 The secrets to these cookies are to chill the dough for a long time, and of course, to use the vastly superior egg replacer of aquafaba (chickpea cooking liquid). My non-vegan coworkers request these cookies regularly, and yours probably will too! 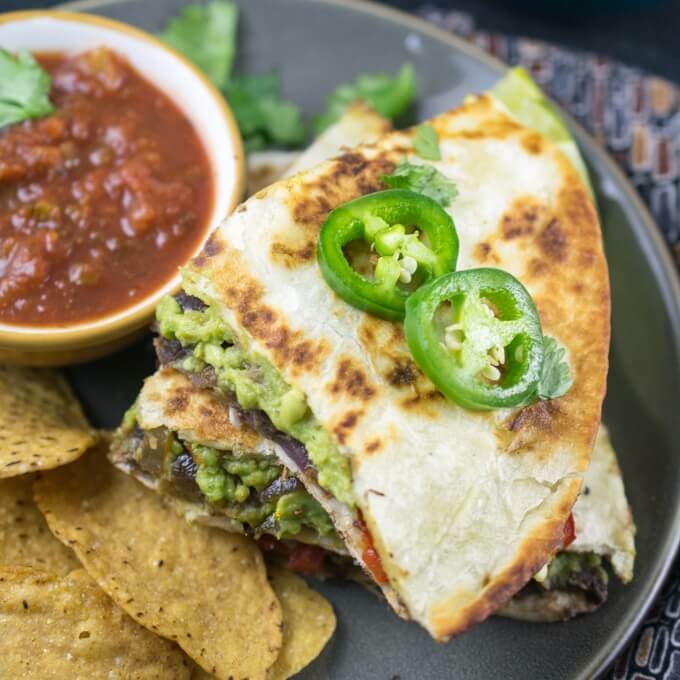 I adore my cashew mozzarella inside quesadillas but for a quick and easy vegan quesadilla option, there’s no need to use a cheese substitute at all! Smash up some avocado, make or grab some refried beans, and add spiced fajita-style vegetables and you have a delicious quesadilla sans-substitute. One reader summed up the recipe by saying, “These were tasty and so easy to make.” A great pantry meal, for sure! 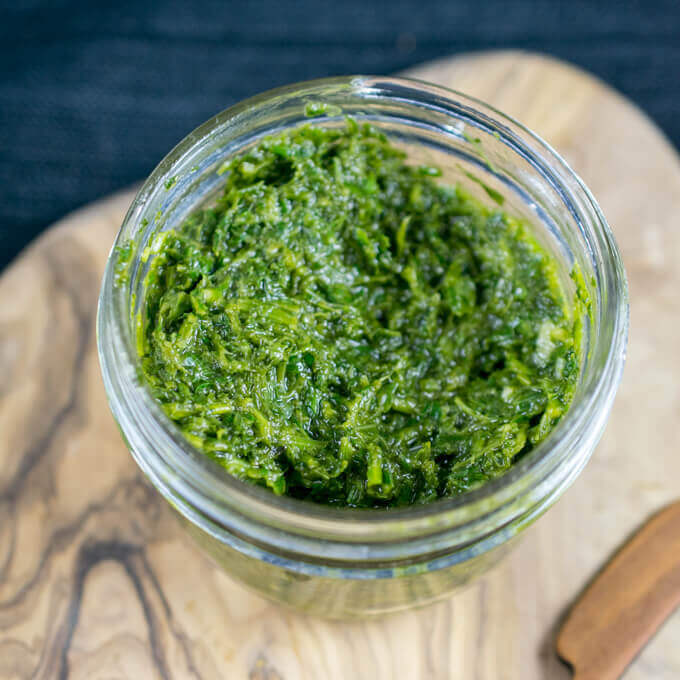 My vegan spinach artichoke dip is actually an old favorite that dates back to 2014 on this site, but this year I finally got around to updating it with a recipe video, new photos, and streamlined instructions. 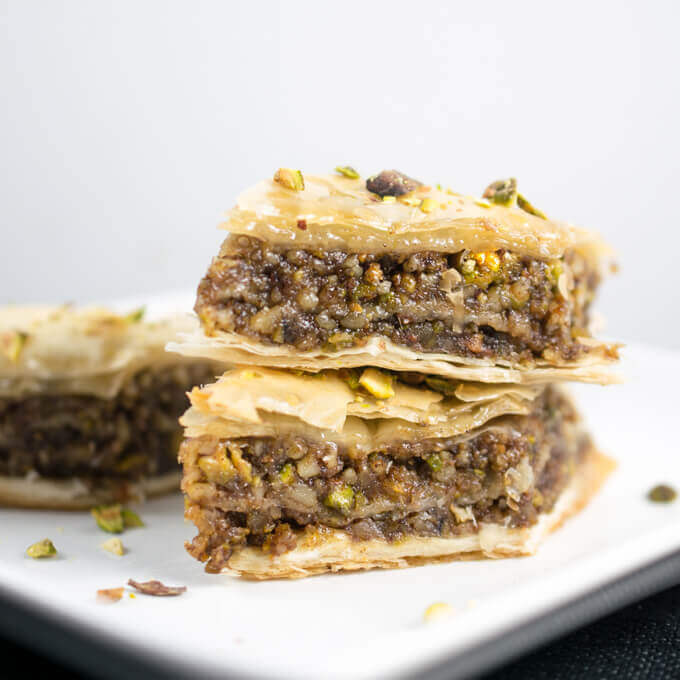 It’s now even more gooey and delicious than ever, and readers agreed, making it my second most popular vegan recipe of 2018! Made entirely from scratch with no cheese or dairy substitutes. 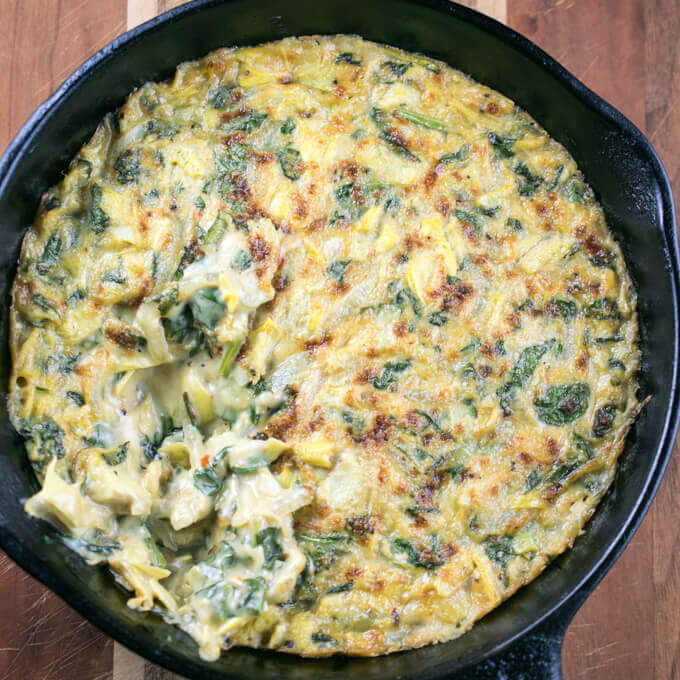 Just creamy spinach artichoke goodness. One reader said, “Just made this last night and it was amazing!! Would not hesitate to make for a gathering of omnivores as well.” Same here! That’s it for my top 10 vegan recipes of 2018! Before we go… I also chose 4 of my favorites from this year that didn’t make the top 10 cut. It was VERY difficult to choose only 4. This job is hard 🙂 Note: it’s winter, post-holidays, and I’m definitely biased toward healthy comfort food right now :). Comforting, delicious, and perfect for when somebody in the house gets sick (which befell us many times in 2018 – working at hospitals will do that to ya). 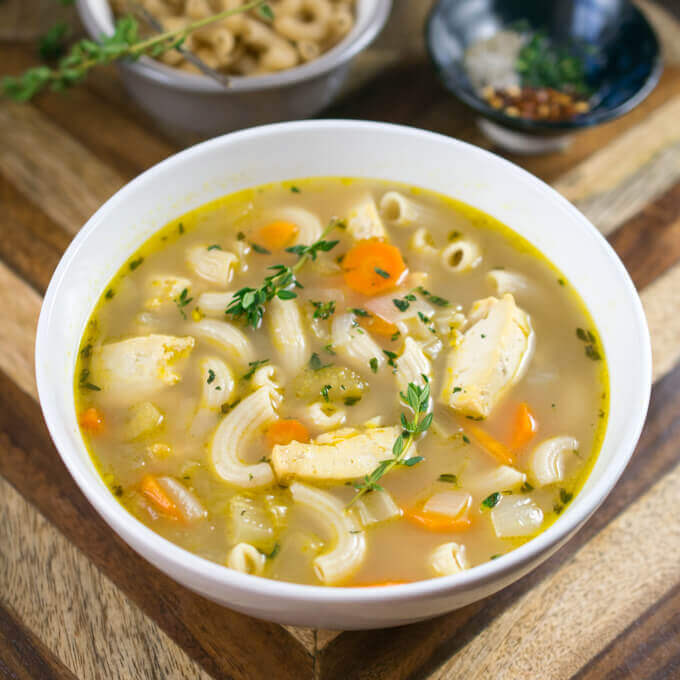 This vegan chicken noodle soup is a perfectly plant-based twist on the classic! One reader said just the other day, “I just made this and it’s superb!! What a cozy treat!! Thank you so much for this recipe wow! One the best broths ever.” I’m craving it all over again! In some ways, 2018 was the year of the vegan crab cake for us. 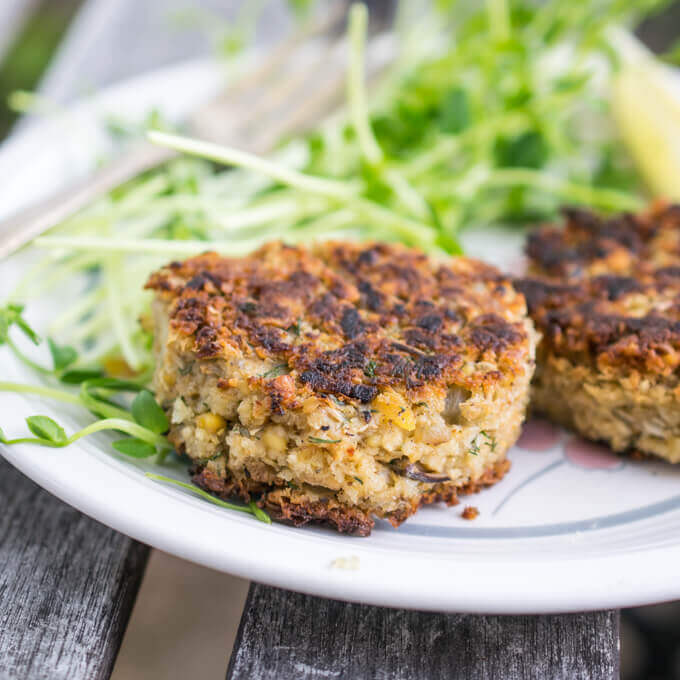 Not only did I nail down this homemade vegan crab cake recipe, but a cafe in our neighborhood also started offering them, and we consumed them copiously. My omni-parents even ate the vegan crabless cakes while they were in town, and loved them! Proud vegan daughter right here. 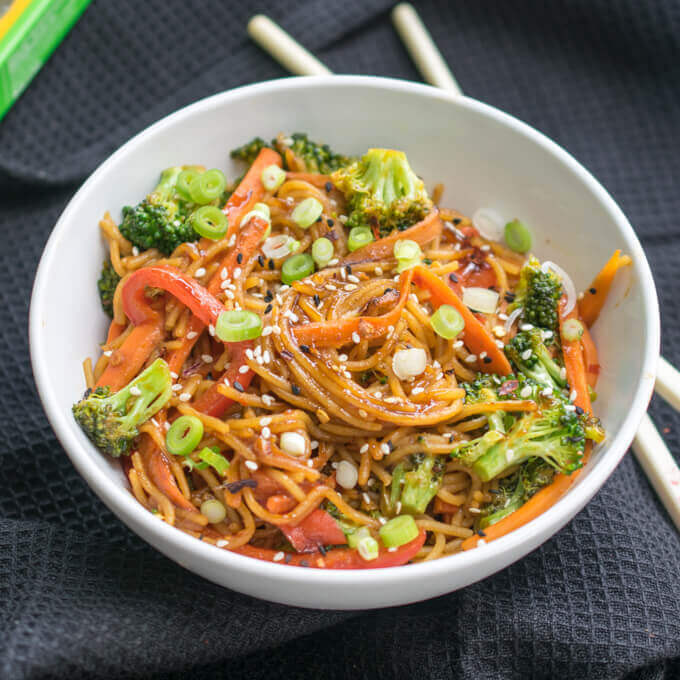 These easy garlic sesame noodles have now become the thing I always make if I need to use up stir-fry veggies and have some noodles in the pantry. The original recipe uses chickpea noodles for added fiber and protein, but you can use any noodle variety you’d like! 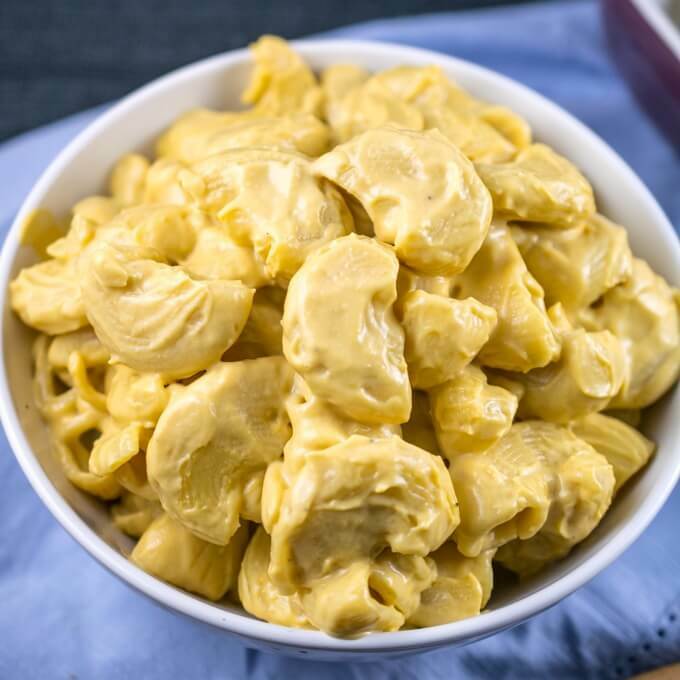 Decadent, rich, creamy, cheesy, and also beyond healthy with no processed cheese substitutes in sight! Bonus: My coworker asked for the recipe based on the smell alone. 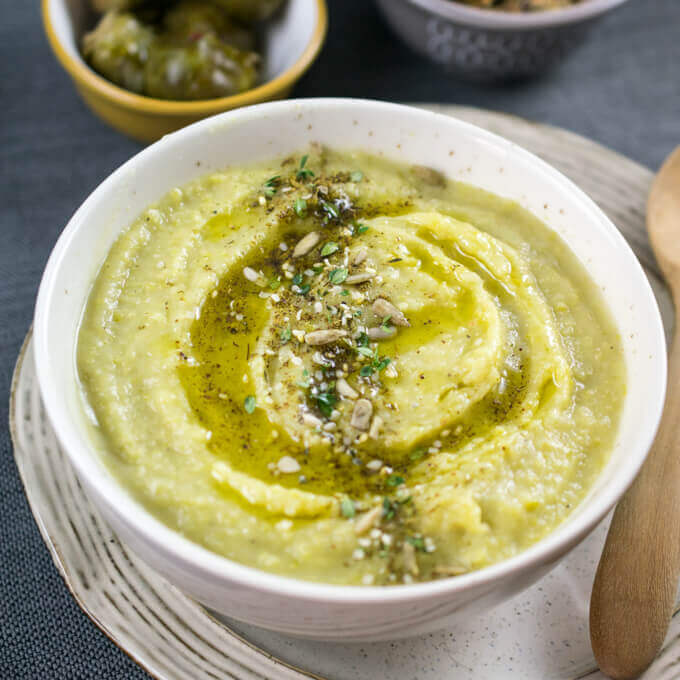 You’re gonna want to try this vegan broccoli cheese soup! From my kitchen to yours, happy new year! Happy new year Shannon and I’m glad 2018 was a good one for you! I am online much less these days, but appreciate knowing your blog (and recipes!) are there. This is a gorgeous round-up. Happy new year to you too, Kari! It’s always nice to hear from you.